Free-swimming fry are as in previous rounds not totally free-swimming. They are staying tight in the spawning substrate. Very few evident swimming in open of the tank even as I pulled it out to look. Then, as I replaced it several dozen came out briefly before swimming quickly back into the substrate. Previous iterations of early rearing also showed strong association between cover and even first feeding Pirate Perch. The cover / spawning substrate used this time is much closer to natural root-wads. Freshly hatched BS applied today and the Pirate Perch fry were all about that. It appears the attraction of the fry to the substrate is based on vision. The fry do not loiter in the open when displaced by moving substrate. Evidence for growth is strong. 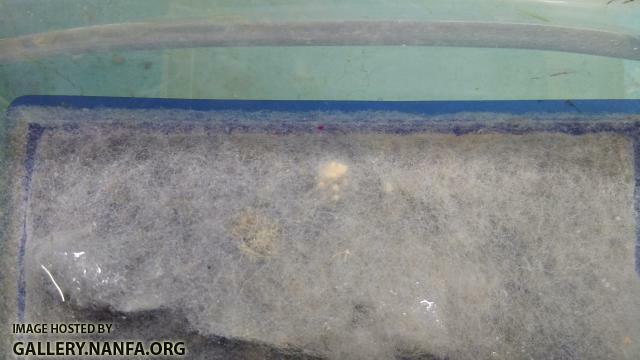 They are no sticking to substrate like glue swimming vigorously to get back in when dislodged. Tomorrow is a big day because going to Poplar Bluff to collect 4 male and 8 females to breed in a new and improved setup. New setup has a 125-gallon aquarium with a much better nesting substrate for egg collection and filming. Male - Male interactions are what I really want to see. This round a better feed (Otohime) will be used. Fish will be trained to approach feeder before actual training to eat feed commences. Nothing, collection attempt to early. I left a big gap in this I see. Fish were collected about 2 weeks after attempt noted above. 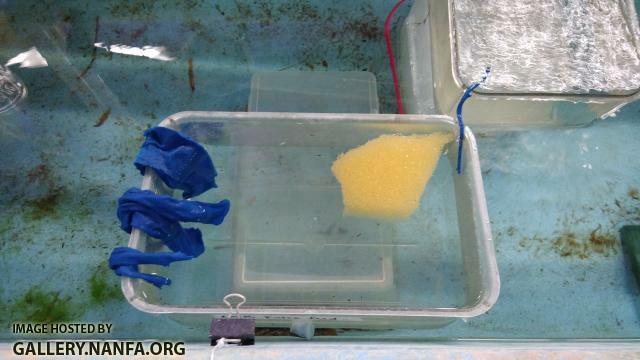 Breeding season missed based on condition of fish collected. 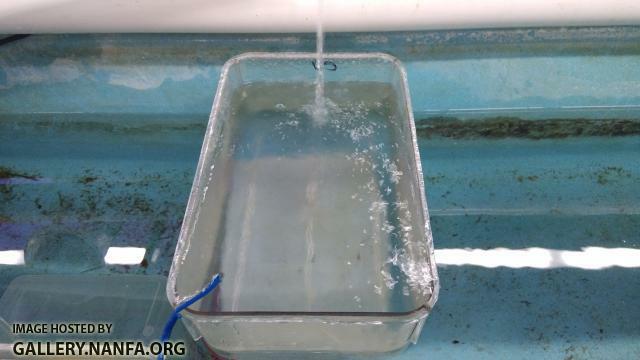 Fish have been held in two stock tanks over the summer where natural forages were encouraged and additional pond harvested forage in the form of mosquito larvae and water fleas were applied as supplements. The Pirate Perch fat as I have ever had them during the warm season. Temperatures dropping and forages I can get from ponds increasingly markedly. The fish are not putting weight. 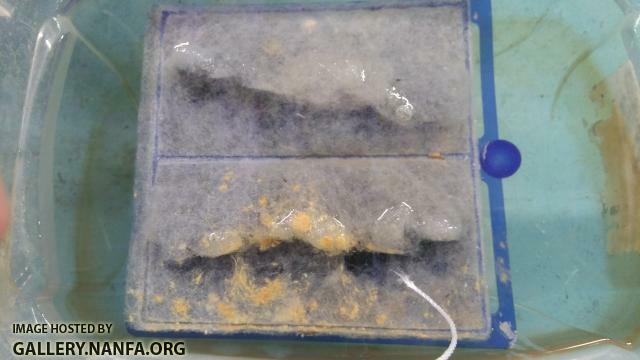 They are being exposed to a natural photoperiod and near natural temperature regime. In about a month they will be given a photoperiod that approximates spring followed by a rise in temperature. Temperature in tanks getting down around 10 C. I am no longer having to add additional water fleas despite grazing pressure from Pirate Perch. Pirate Perch are starting to put on more weight. About time of first ice cover, if that can happen with tanks as they are protected, warm up with increasing photoperiod will begin. 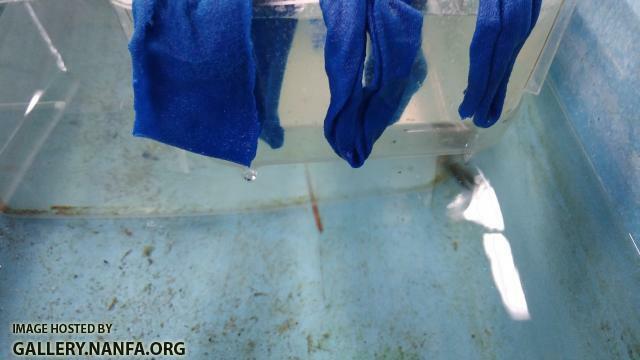 Then fish will be brought back to the breeding tanks where cameras can actually work. I have something really cool going on now since Pirate Perch breeding group are being housed in a raceway with good well water flow. The dominant male is becoming much more active in defense of the breeding site provided. He appears to be responding to other fish based on visual cue and attacking all fish that come within a foot of his spawning area. He is effectively excluding other fish in a manner reminiscent of sunfish defending nest sites. The behavior was not apparent under conditions used to keep the fish previously. Great observation! Thank you for sharing! Do you have a sense of the flow rate in the new setup? Additionally, is the flow rate constant and is the flow consistent throughout the raceway (or are there quieter zones)? Thanks. Looks like at least three spawns of Pirate Perch produced from fish I considered to be spent. The appear to be two to three days apart in terms of conception date. Females doing the business are on the lower end of the adult size range appearing to be age-1. All effort is being made to ensure they incubate at what should approximate a natural temperature range. Will begin culturing brine shrimp on Monday. new and improved prefabricated nest where I ripped middles to form to ledges. The fish spawned mostly below ledges when the nesting material was in an upright position against side of the tank. This one nest site could support well over a thousand embryos with good hatch. Remains of a clutch with poor hatch rate (approximately 50%). Eggs appear greatly enlarged because of fungus. A couple larvae and a prolarvae lying on its side. Most are still inside the fibrous material of the nest site. 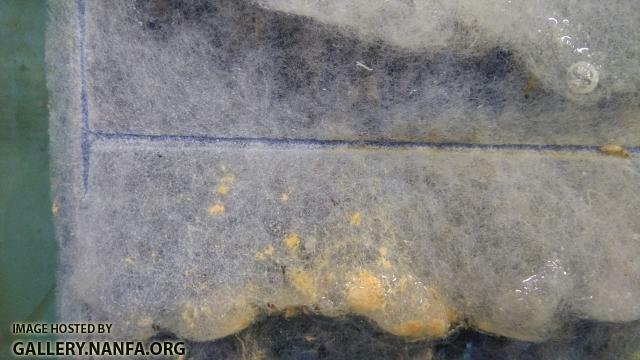 Look closely to see a couple larvae near surface over the fibrous material. They are already interested in zooplankton. Tonight 4H kids and parents will help collect and enumerate the larvae for culturing. 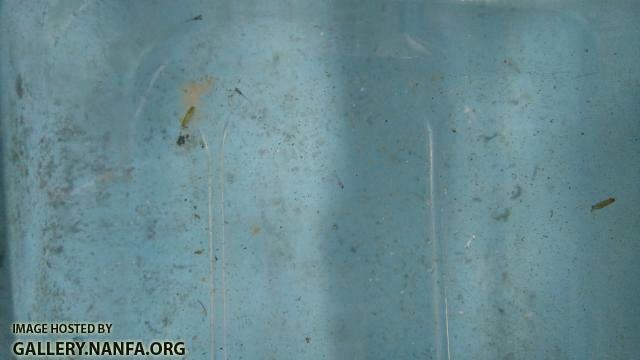 Larvae now to point where they can readily consume smaller water fleas so being prepped for moving to larger quarters. Currently 55 left based on hard count. They will be provided structure in the rearing tanks so they can relax. 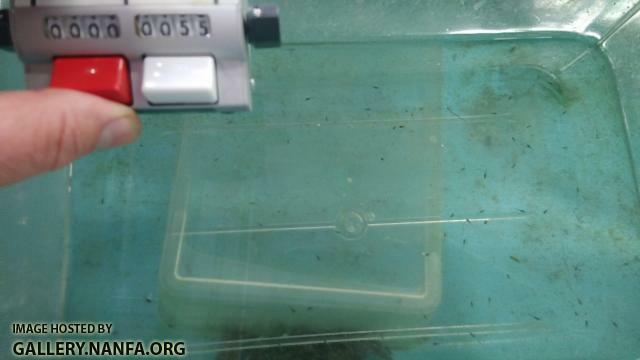 Adults are being fed larger water fleas, but none are putting on weight. I still have not figured out how to make adults grow well. My gut feeling is they are stressed by stocking density being too high. You will have to trust me that they are larval Pirate Perch. Larval Mole Salamander. It be a pest, although not as bad as Tiger Salamander. Do not let them in with fish smaller than their head. This is great stuff. I mean yup they look like specs. But I believe they are pirate perch. 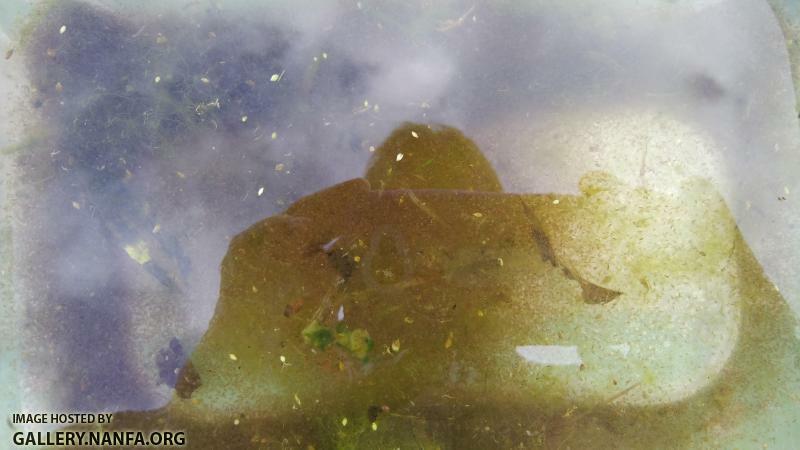 Adults are being fed larger water fleas, but none are putting on weight. I still have not figured out how to make adults grow well. My gut feeling is they are stressed by stocking density being too high. 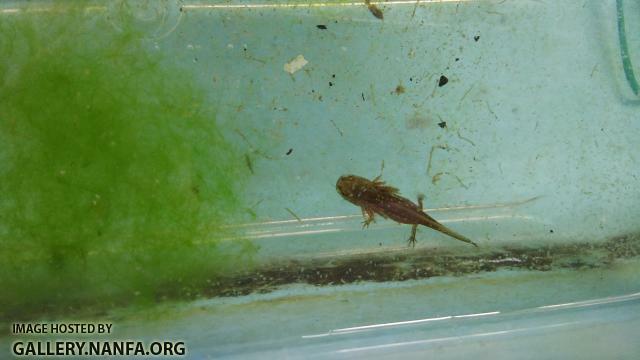 How about feeding them "pest" Ambystoma larvae, or frog/toad tadpoles? The Ambystama larvae are too big, some not even safe to co-mingle with small adult Pirate Perch. The Ambystama grow fast like Muskie and Paddlefish, but do so with very little food. They are very efficient converters of biomass. Maybe we should be farming Ambystama as an animal protein source? We had exceptional growth of a Grey Tree Frog over winter where eat converted food very well. I am having some fun here with coolwater aquaponics system that I never thought possible. 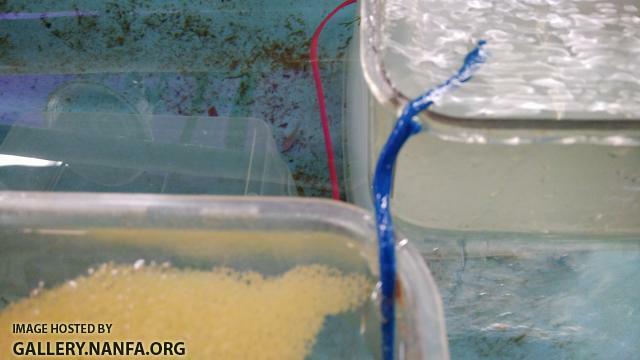 Below is wick system making so I can get away from using extremely small siphons that either clog or allow larvae to escape. As done currently also allows maintenance of very stable water temperatures without a fancy heat pump or finicky water heaters. Culture tank sitting between head tank and raceway. Elevation is also intermediate. Head with only a small percentage of flow directed to culture tank. That is awesome. Innovative as can be. Wicks made by confiscating a shirt left in bathroom by student after student told multiple times to collect effects hang and them up properly. Shirt trimmed of strips before I hung it up, properly. Strips were further trimmed to make proper sized wicks. I am a busturd.